Applications and tools for TI calculators! This page shows some tools and applications for TI 68k-based calculators. Some of them have a single page only for them, click on the headers to access it. Some of these tools are for PC, or they're mixed, like Text Walker which does include a TI and PC editor as well as converters. A complete text editor and viewer for TI, including PC tools. A library which was used in a few of my games. Not very interesting, because it's not very fast and does not feature function names, but numbers (e.g. 4=rectangle, 26=map, 666=reset), totalizing a number of a bit more than 40 functions. Features a few samples which shows the usage of the library and an unfinished documentation which describes up to the function 28. An unfinished library that was useful for TI-BASIC. Functions had real names, you could type things like lib("DrawStr 0,0,Hello"), manipulate internal variables to create simple loops, access TI-BASIC variables and even manipulate lists and argument stack. Another example is: lib("nY=0:_bcl:Line 0,nY,160,nY,2:nY+:If nY<100:Goto bcl"). It will draw a lot of inverted lines on the screen, MUCH faster than TI-BASIC would (or with multiple library calls). 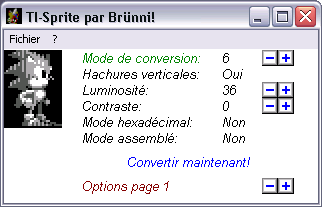 A sprite converter designed for being used with TIGCC projects. It does feature grayscale and dithering as well as luminosity / contrast settings.